The Town Food Service Mongolian BBQ range has a 42 in. cast iron flat top and also has cast iron burner deflectors and is gas powered. 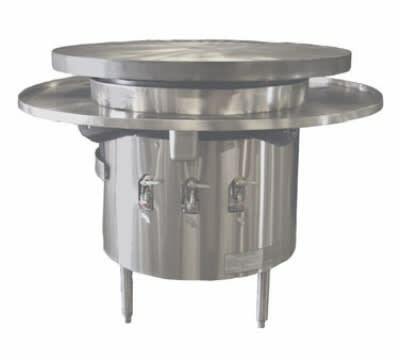 This particular BBQ range has (3) 18 tip vertical shield burners, has a knee "L" lever gas handle and the entire unit is mounted on cross braced legs. This entire Town Food Service Mongolian BBQ Range is made from stainless steel for added durability and strength in use.